Europeana has become the unifying entity that brings together collections from all domains: libraries, archives, audiovisual collections (both television and film) and museums. Alarmingly, Europeana’s future is under threat. In the next few weeks, Member States are expected to decide the EU’s budget for 2014-2020. The way the budget of the EU’s Connecting Europe Facility is allocated will determine how Europe’s rich heritage can be enjoyed, studied and repurposed. With this post, EUscreen would like to extend its full support to Europeana’s #AllezCulture campaign to secure EU funding after 2015. Europeana has evolved from a temporary project to a full network organisation. To date, it has successfully standardised and connected data from over 2,200 organisations, which cover all European countries and 29 European languages. An important, unifying asset for Europeana is that it serves as the innovative ‘hadron collider ‘ for Europe’s cultural sector. It does so by leading the movement towards open access, by harnessing the power of participatory culture and by implementing emerging IT standards in working systems. With a critical mass of content available online, the exploration of new applications by the creative industries are now taking shape. By making collections available online, interest is raised in both the public and commercial sectors. EUscreen for instance has already seen an increase of footage sale requests from the content that is made available through the portal. Without support from the European Union, EUscreen would not exist today. EUscreen and its sister projects such as the European Film Gateway have been granted financial support within a wider EU policy on providing unified access to Europe’s audiovisial heritage. Today, Europeana provides access to over 181.000 audiovisual items, a number to grow exponentially over the next years. EUscreen and Europeana are connected in many ways; they are part of the same ecosystem. Not only in terms of technical standards to make unified access possible. The vision is, and has to be, much more ambitious than that. In an online context where sharing is the norm, it becomes almost a necessity for memory organisations to make their collections available online in order to retain and support community interest. Collections and their users now share the same information space. As a result, organisations rapidly need to adapt to maintain their relevance in this changing environment. We already see how, in the current economic climate, public libraries and public broadcasters are put under pressure to continuously demonstrate their added value, also in terms of their direct economic impact. This can be difficult to measure, also given the changing context in which these organisations find themselves in. Memory institutions need to receive the necessary support to forge their future missions and services, collaboratively. The Europeana Network will play a key role here, as it has broad support across memory organisations, has deep understanding of various stakeholders and also the critical mass to make necessary policy recommendations heard. Over the years, EUscreen has become the leading network of television collection holders with a united vision to share the wealth of their collections to a wide and diverse audience. With support from EBU, FIAT-IFTA, PrestoCentre, IASA and other key stakeholders, EUscreen is making this vision a reality each day. Currently, 29 archives from 25 countries are connected to EUscreen. EUscreen provides free and non-commercial access to Europe’s history as captured in moving images. This collection will continue to grow, and so will the services offered through the EUscreen portal. For instance, by further supporting multilingual access through subtitles, or expanding the material on the open access portal. This summer, the EUscreen Foundation will be established, providing the legal framework that will govern the EUscreen network as it expands well into the future. Connect Europe’s citizens. To understand the past and to appreciate cross-cultural differences and commonalities. Europe has collectively invested over 1.2 billion euros in digitisation. Europeana is the only platform that brings this data together and offers it for unlimited use. We have just begun to unlock its potential. 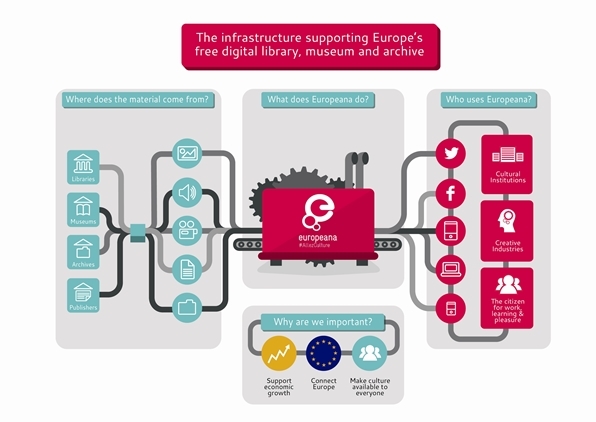 We, therefore, urge the EU to allocate sufficient funds in the ‘Connecting Europe Facility’ to allow the Europeana Ecosystem to further expand and live up to its ambitions vision. We encourage all audiovisual archives to express their support. Capture the attention and imagination of the people who influence decisions on CEF funding – raise your voice and share the successes and value that you have helped create via Twitter, LinkedIn, Facebook and any other channels you can think of. Please visit the #AllezCulture! Campaign page and see how you can help. On this Facebook group you’ll find information and materials that you can use to support our shared cause. Header image remixed from the National Media Museum’s EMI CPS Emitron Camera Head, 1950 on Flickr Commons.